While there are many products that can help make bathrooms child-friendly, they are usually temporary solutions that generate clutter and lots of adhesive residue. Having child-friendly features integrated into the bathroom design is ideal. 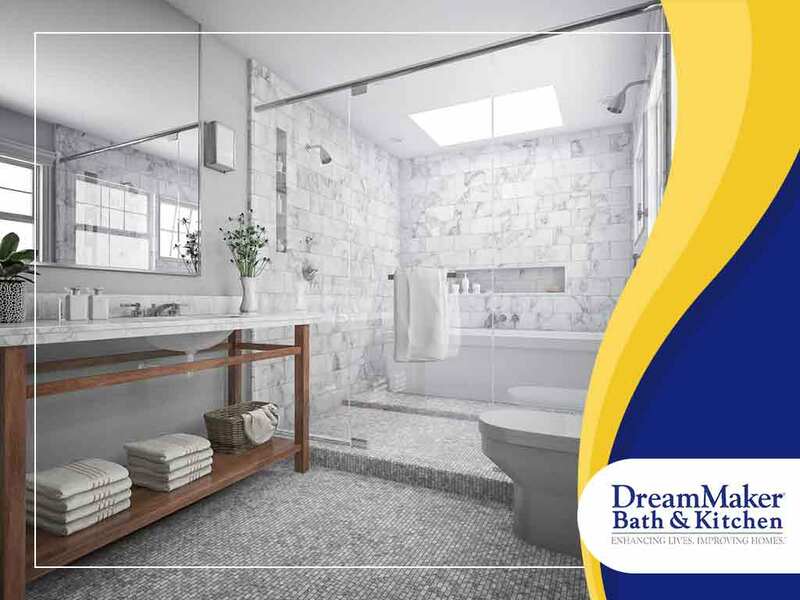 In this blog, DreamMaker Bath & Kitchen lists child-friendly improvements for your next bathroom remodel. Adult-Sized Vanity With a Tuck-Away Bathroom Stool — Some bathrooms have a second, lower vanity made just for children. But your remodeled bathroom will last well beyond your kids’ teenage years, rendering the low vanity useless. An adult-sized vanity with a tuck-away bathroom stool is better, as you can get the most use out of a single vanity, which makes it perfect for bathrooms with limited space. For maximum storage, the tuck-away stool can be built as a small storage chest. Granite Countertop — Granite is a great material for bathroom and kitchen remodel countertops. It’s virtually scratch and stain-proof and comes in many natural colors that fit in with most bathroom color palettes. No matter what kind of mess your kids make in the bathroom, you can rest assured knowing it won’t stain the countertop. The smooth surface also makes it easy to clean, and less prone bacterial growth. Quartz is another good option with the same qualities if granite isn’t available. Shower With Sprayer Attachment — Adult-sized showers may exert too much water pressure that can be uncomfortable for kids. A separate sprayer attachment allows appropriate shower height and better control on the water pressure. It also makes cleaning the tub easier after the kids. Anti-Scald Devices — Anti-scald devices are faucet and shower attachments designed to keep children from scalding themselves with hot water. These devices feature mix tap water with hot water automatically, safely turning hot water to warm. A hidden or locked valve lets adults dial the tap water back if they want hot water. These devices are simple to install and can be done during bathroom remodeling. DreamMaker Bath & Kitchen is your leading provider of whole home remodel services. Give us a call at (952) 388-0306 or fill out our contact form. We serve clients in Minneapolis, MN, and surrounding areas. Is Hardwood Flooring Right for Kitchen Remodeling in Robbinsdale?